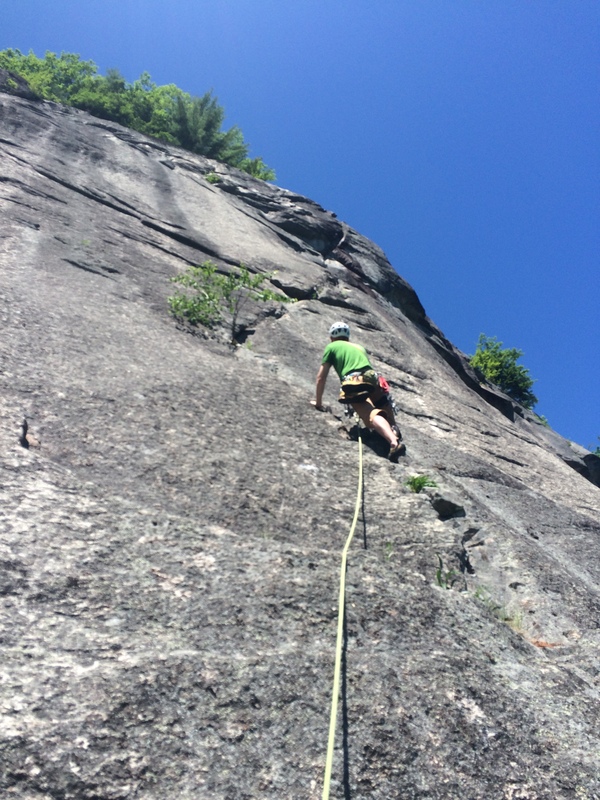 When you think of Cathedral Ledge moderate rock climbs what comes to mind? You’re probably thinking of Fun House, Upper Refuse, Toe Crack, and Thin Air. Mountain Project agrees as they are the “only” classics sub 5.8. They are great routes, with long and rich history, and sometimes long lines. There are some less traveled moderates that, for a solid 5.7 leader, can provide some of the best situations & climbing anywhere on the cliff… and they never have a line! Pitch 2 of Diagonal. Just keep breathing. “Easy, but wildly exposed”- the new Handren Guidebook. 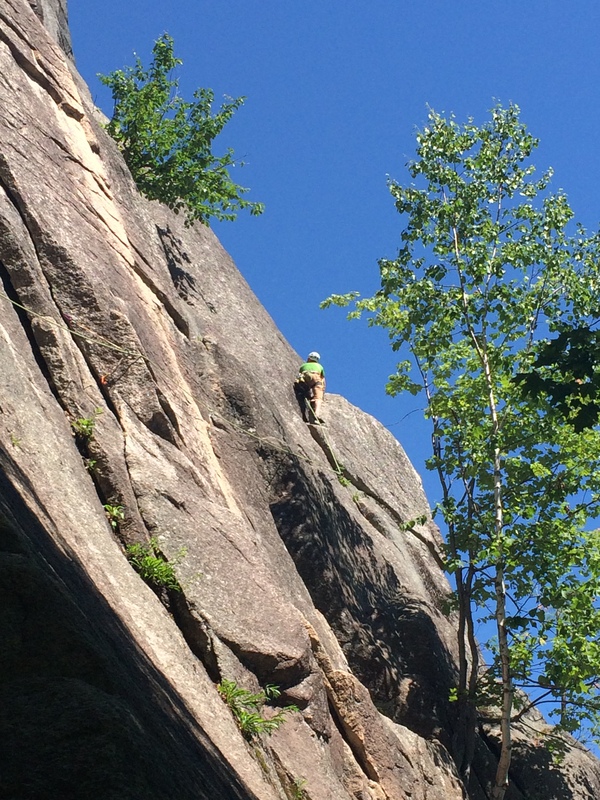 I’ll challenge anyone to show me a pitch of 5.4 climbing in New England with this kind of exposure. The 160 foot dike provides good holds while the expanse of the Mordor Wall dropping off below makes it important to keep reminding yourself this is only 5.4. While it may be worthy of an “R” rating a slip any where along the pitch should result in a clean, though spectacular, fall. There are 2 pins that can lessen the run out toward the top of the pitch but they can be hard to spot. Tom didn’t see either of them and sent it anyways. Why don’t people do it more often? Well two reasons really. For one getting to the 1st anchor is a bit of a PITA. 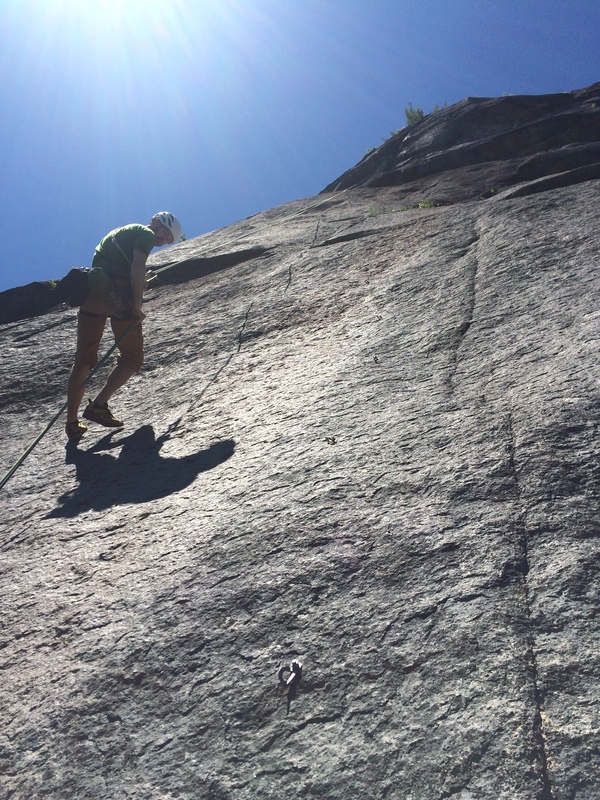 The easiest way is to climb the first pitch of Standard Route then cross over the chimney and scramble up right to the big beautiful block with the bolted anchor. It’s only 5.6, but the step down to Toe Crack is a bit weird for both the leader and the second. 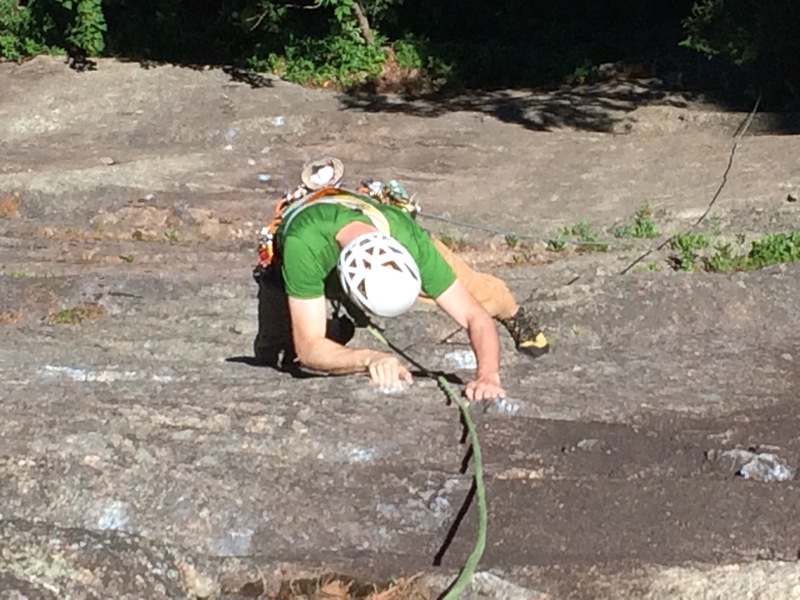 Pitch one of Standard Route, use long slings, then cross the Chimney and head for this big block! More importantly I think it is because both old and new guidebooks call it 5.9+ R with Poison Ivy. That’s Pitch 3! We are not doing Pitch 3. We are now rapping down the Mordor Wall. 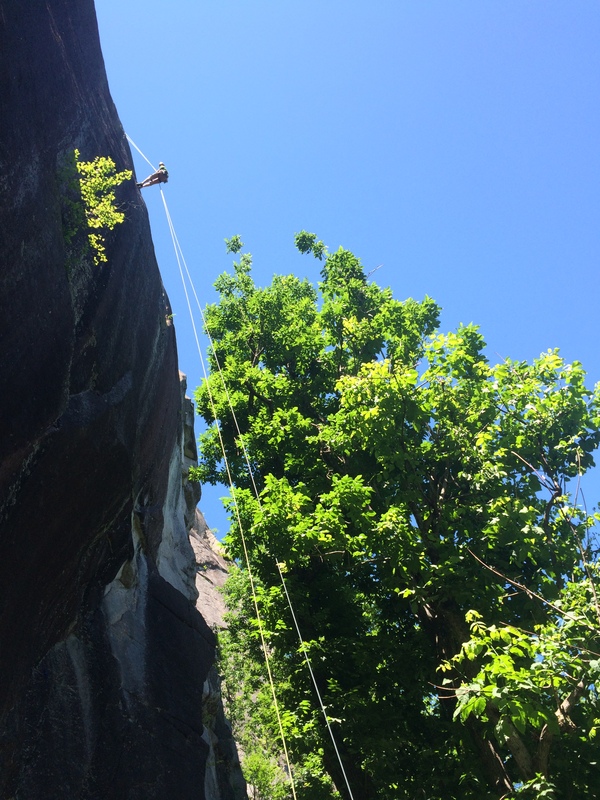 A clean 120 foot rappel brings you to the Free Finale anchor (hanging station, just under an overlap), then a 160 foot rappel that ends free-hanging brings you to the ground. Scramble up to the first ledge, move right so that the small tree behind you is technically your first “piece”, no need to clip it. Step right off the ledge to get on the dike. Climb 20 feet up on good holds. A green Alien or equivalent will give a marginal placement in a crack to the right. Might as well extend that draw, as this will be the biggest bend in the route. Deep breath then up and left and you’ll come to an awesome natural thread. This is the first real good gear, and to paraphrase the poster on Mountain Project “gives you that I won’t hit the ground feeling”. It’s at least 45 feet up, so it’s kind of equivalent to soloing the first pitch of Thin Air, if you know what I mean. A great horizontal comes up, BD #2, then it gets a bit necky again. A couple more small Aliens/cams can help, but there will be better gear closer to the top. Corners and Cracks, Corners and Cracks, Corners and Cracks Oh My! This route is known as an ultra classic three pitch 5.9, but the long first pitch is a worthwhile climb in its own right. A couple of the 5.7 moves feel a bit exposed but the gear is quite solid through-out, with just the management of rope drag being an issue for some. The “perfect small ledge” that the pitch ends on is one of the nicest spots to take in the view on the cliff IMO, and you finish with another steep rappel back to your packs. 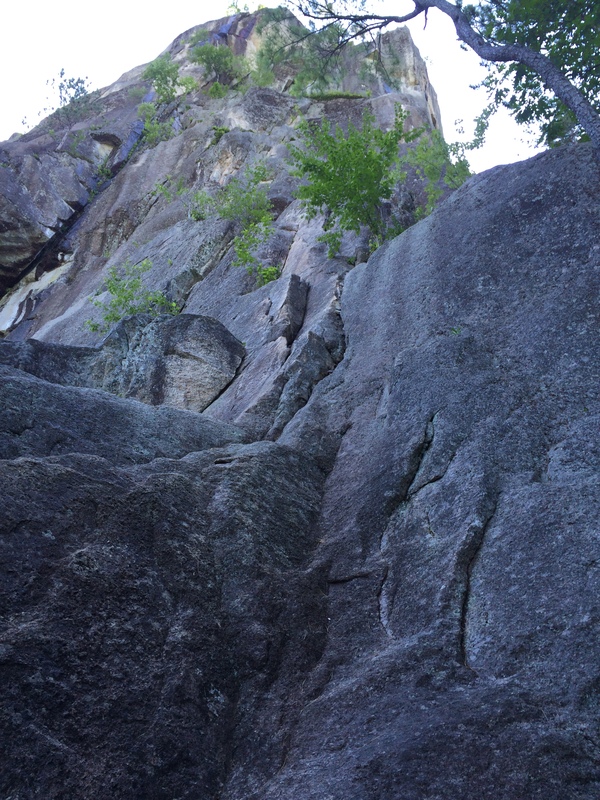 When compared to places like the Gunks & Precipice we don’t seem to have a lot of moderate classic climbing on Cathedral. But a second look will more than double the amount of quality moderate climbing that can be enjoyed here. Once 5.8 & 5.9 are comfortable Cathedral really opens up, and there are some classics that haven’t been recognized as classics yet (Raising The Roof/The Liger). And fun link-ups, like Toe Crack into Thin Air, Black Lung into Final Gesture… great combos if you are really comfortable at the grade. Any other more obscure but quality moderates (under 5.9) you enjoy on Cathedral? Don’t worry, I doubt they will get too crowded. Comeau’s Finish (.7) has fantastic position and is great on crowded days… a few others up there in the .9 range also. Comeau’s is awesome, only slightly reduced by the down climbing shenanigans to get established on it, and the real 3 star part is only the last 15 or so feet, IMO, but I do love those last couple moves! 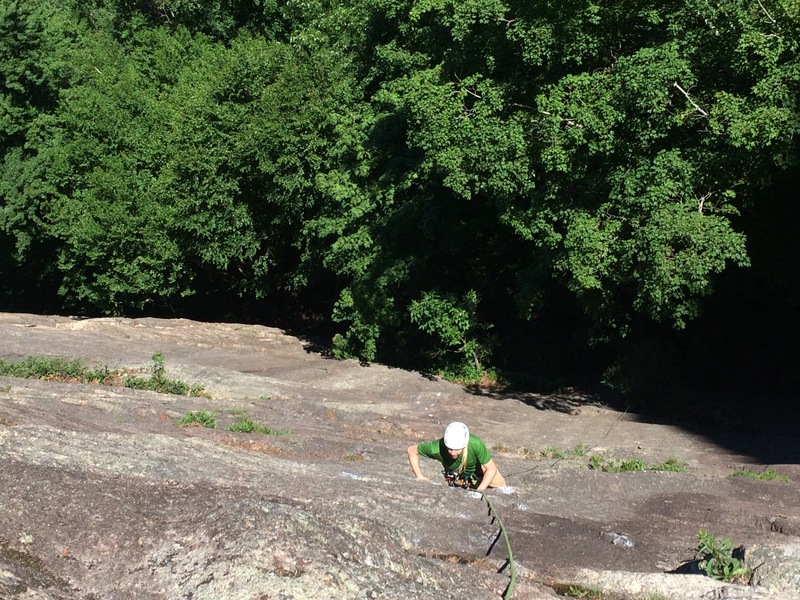 Endeavor is a great one… more people should check out the moderate classics at “the other” White Ledge in Albany… it has quite a few great new routes since 2011 that fit the bill.